Have you ever heard of the word: “re-upping?” The definition is: “re-enlist – to renew an arrangement or covenant agreement or contract.” I came upon this word praying about a “re-launch” for myself several months ago when I proactively agreed to return to parish ministry here at the Mingo United Methodist Church! I appreciated the word in its full meaning which described what God was asking me to do. God’s call was to re-up my calling and to re-up my leadership and commitment to the vision and mission that God has for me as the pastor and for our church. 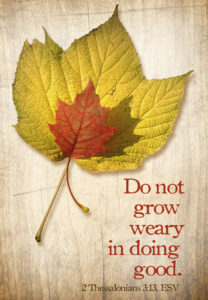 Galatians 6:9 “re-ups” us when it says: Let us not become weary in doing good for God, for at the proper time we will reap a harvest if we do not give up. In the scriptures, the word “anago” is used in reference to the believer and to the church. (“The World is our Parish”) and to “re-launch” ourselves! We are going to put our legacy as Christians on paper in a renewed covenant between ourselves and God. Begin to share the news! Begin to pray about your involvement and leadership. We will be asking you to consider what you need in the coming year to grow in your faith as a basis for the “launching” of study groups, small groups and sermon series. 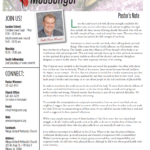 Click here to read of the October Newsletter!